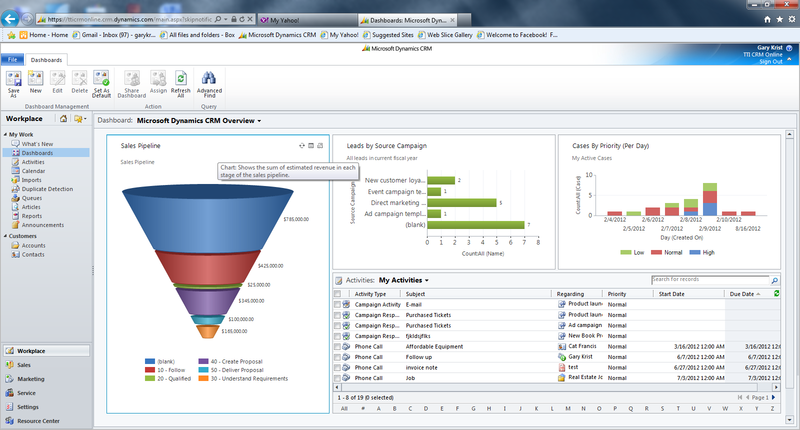 Microsoft Dynamics CRM: Your “Winning Formula” for Sales Success! Microsoft Dynamics CRM can be more than just Marketing, Sales and Customer Service tool. Microsoft Dynamics CRM has the ability to enable your VP of Sales or Sales Manager to customize and automate the software to your unique Sales Process. The power of Microsoft Dynamics CRM designed around your organization’s sales process can provide more visibility for management and better collaboration among your sales team each sales opportunity. Microsoft Dynamics CRM provides the ability to assign tasks to each member of your sales team with specific due dates and notifications, assuring that everyone on the team is on the same page. Sales members can enter notes on each task and mark them complete, triggering a notification to the sales person that the task is complete and that the opportunity is ready to move to the next stage of the sales process. Invest an hour with Gary Krist from Turnkey Technologies, Inc. and Ric Hoerz from Sandler Training at the Rubicon Institute, to watch and listen to our webinar called ““Increase Sales” Combine Sales Methodology with Automation” on October 3rd. You will gain valuable insights to increase sales productivity throughout your organization. For a high level estimate of your investment in Microsoft Dynamics CRM, please use our “FREE” Microsoft Dynamics CRM Quick Quote Tool”. It will give you a great starting point for assessing your potential investment in a project like this. Microsoft Dynamics CRM can help your organization drive sales performance through sales automation. To learn more about Microsoft Dynamics CRM, please go to our website www.turnkeytec.com or give us a call.